Wireless Bluetooth Streaming- Wirelessly connect up to 2 smartphones or tablets to the speaker and take turns playing impressive stereo sound. peaker and take turns playing impressive stereo sound. Enjoy music for 24 hours without missing a beat. Imagine playing with your favorite beats from sunrise to sunrise on a single charge. Use the massive 20,000mAh battery and dual charge out to charge your external devices anytime and keep music rocking. Rugged enough to handle your wildest tailgate party, the JBL Boombox is IPX7 waterproof, which withstand any weather and even the most epic pool parties. Switch between indoor and outdoor modes to optimize sound wherever the party is. 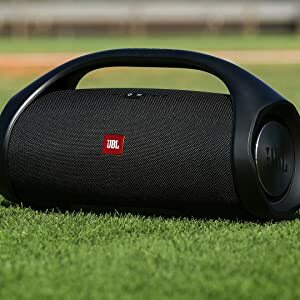 In addition, if more massive music is a must, you can connect more than 100 JBL Connect+ enabled speakers under bluetooth range with just one press of a button.